HEART were approached by Converse to conceive, design and implement a premium onsite activation at the 3 day Heineken Jammin Festival in Italy, and with a lead time of only 3 weeks before the activation start date. Converse wanted the opportunity to showcase the classic Chuck Taylor product, but in a style and environment that really brought the timeless edge of the shoe brand to life, while playing on the core promotional values of the 'My Converse Century' campaign; timelessness, fashion and individualism. Retail Store – Converse teamed up with Footlocker to provide a retail store selling the Chuck Taylor brand. Brand Experience – Shoes purchased at the retail store could be fully customized at the 'Pimp your shoes' workshop area, where 3 of Italy's leading graffiti artists created unique hand painted artworks on the shoes. 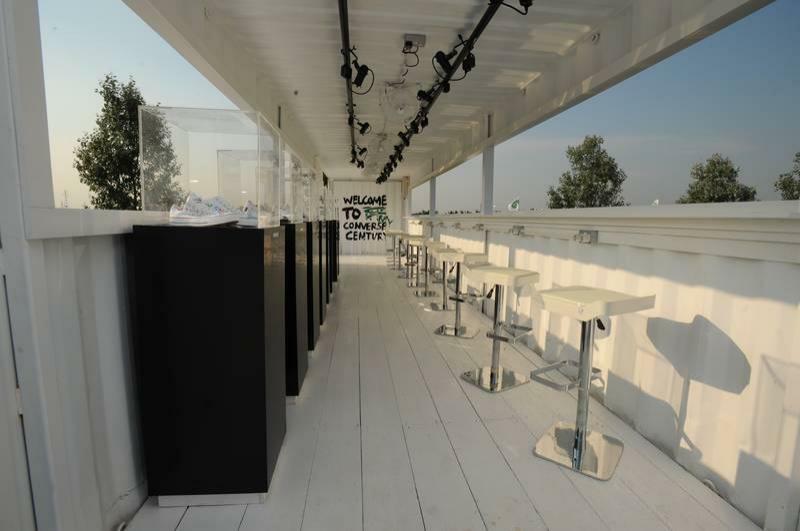 There was a second tier to the brand experience which included a showcase of celebrities 'signature' shoes in a museum styled display environment, including some the headlining artists at the festival, Sting and Iggy Pop. Festival Experience – The experience included a gallery viewing area of the main stage with telescopes and binoculars, a chill out area and giveaways from brand ambassadors, such as personalised branded photo's of the festival experience. Conceptual research and design for the festival activation. Sketch illustration, 3D visualisation and flythroughs of the brand experience. Technical design and planning of the brand experience including full schematic details, scheduling and purchasing of all fixtures, furnishings and fittings. Project management, timetabling and quality control of the scenic fabrication and electrical installation, including transportation and installation into the festival site over a 2 day period. Commissioning of full structural engineering reports. Design and installation of all branding and artwork assets. Sourcing and management of all event and promotional staff, brand activities and materials. Site management, including services (water, waste, power), event logistics and planning, which included project specific H&S documentation, risk assessments, evacuation plans and emergency procedures. Click here to find out the design process of this event for Converse.